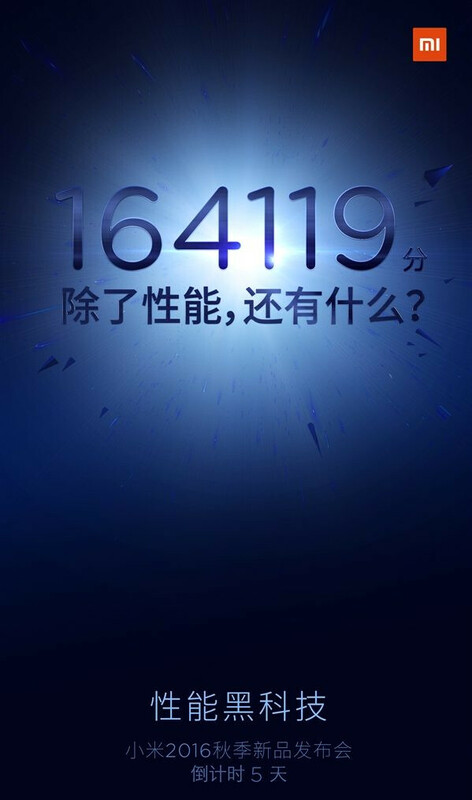 The unannounced Xiaomi Mi 5s recently scored over 164,000 on the AnTuTu benchmark test. That is a very high score that was slightly topped at 164,119 when the handset made another AnTuTu test run. And that is the score that Xiaomi choose to memorialize on a teaser for the power packed model. The Mi 5s will feature a 5.15-inch Force Touch screen with a 1080 x 1920 resolution. Under the hood is the Snapdragon 821 SoC with a quad-core 2.15GHz CPU and the Adreno 530 GPU. Qualcomm's ultrasonic fingerprint scanner is embedded under the screen. The 16MP rear camera offers 4-axis OIS, PDAF, and an aperture of f/1.8. For those who snap selfies, a 13MP front-facing camera is on board. A 3490mAh battery keeps the lights on. There are reportedly two different versions of the device. The Mi 5s offers 6GB of RAM with 128GB of native storage for the equivalent of $299 USD. The Mi 5s Plus comes with 6GB of RAM and 256GB of internal memory for the equivalent of $344 USD. Xiaomi sent out invitations last week for the unveiling of the Mi 5s, which will take place on September 27th. People still care about Antutu scores? Same can be said otherwise, there are also Apple fans that always brag about scores you know. Was there ever in history of phones after iPhone 2g that anyone else made a better more efficient cpu than apple? Its not a secret, apple's cpu are the best, it is that simple. I dont need to wait for next year, I know 110% that A11 will be better than anything mediatek and qualcomm can offer.The difference is Apple will never go into this silly ad wars about scores and giga of ram and cores and all that crap that android OEM's brag about. Even if they can win in some of those areas. It just shows how desperate a company is, and Xiaomi loosing ground to Huawei is currently very desperate. Honestly antutu v5 shows much better and benchmarks than antutu v6. Antutu v6 shows 109k scores for my phone and next time it shows 85k scores. AnTuTu v5 shows only 1-2k difference. That 6GB /128GB version is looking very good to me! 2016 has been a kid-in-a-candy-store kinda year for me...I'll have to make a decision by Christmas. Axon 7, OnePlus 3, Xiaomi Mi5 ceramic, Xiaomi Mi5s, or Google Pixel/-XL. Too many good choices! I dont buy phones because of benchmark scores. They mean nothing just numbers on a screen. Android OEM's are trying too hard to convince you my phone is better cause it made better score on antutu. You buy the phone and it lags more than a 3 year old nexus. only 128GB and 256GB? and only $50 price difference? next year's flagships should follow this style..
Samsung and Apple will never follow that, makes no sense to lower your price when you are selling better than ever with same high price. A worthless benchmark score that means nothing. AnTuTu has become a joke since v6. No more taking it's score seriously.